You are here: Home / Uncategorized / Unicorn Tails! It feels like winter is never going to end! This has been one of the coldest winters in New Jersey and even as I blog now, I’m hearing meteorologists talk about yet another snowstorm on the way! 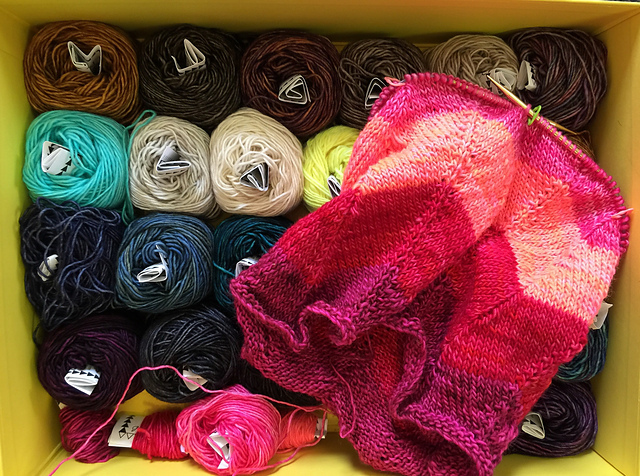 I can’t pretend I’m not a little excited about staying in and knitting! Here at the Yarn Attic we are currently working on a few projects using Madelinetosh Unicorn Tails. We are all about these little guys! There are just so many possibilities!!! These little babies come in 52 yard “mini skeins”of Tosh Merino Light yarn. Unicorn Tails are a single ply, 100% superwash merino wool, that come in an assortment of colors, ranging from neutral colors like Silver Fox and Antique Lace, to neon, eye-candy colors like Edison Bulb, Neon Peach, and Pop Rocks. The bursts of color are so refreshing and reminiscent of springy florals and summertime festivals and carnivals. They take us away from this snowy, cold weather!! Rhonda has made these beautiful knit necklaces in the colors Mandala, Coquette, Pop Rocks, Flashdance, Worm Denim, and Fathom with Kirsten Johnstone’s sev[en] circle pattern available on Ravelry. 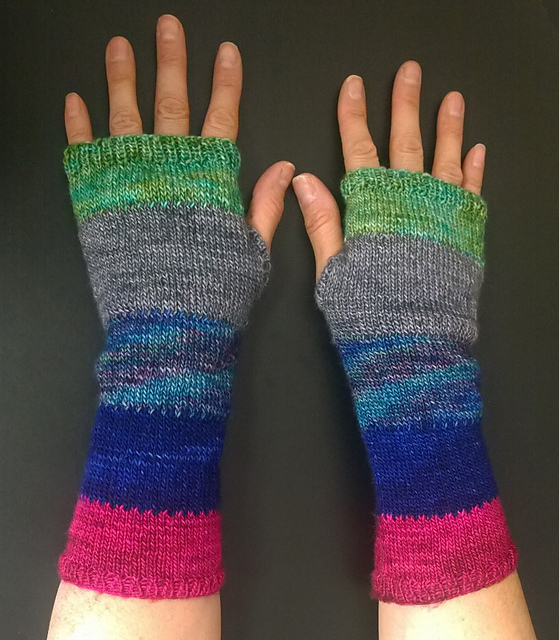 She also made these gorgeous Purl Bee Colorblock Hand Warmers using fathom, Coquette, Charcoal, Mandala, and Big Sur. Aaaaand is currently working on this pretty Unicorn Stripes scarf by Antonia Shankland that is available in the Madelinetosh Ravelry store. What will you guys be making with Unicorn Tails? Be sure to follow us on Facebook and Instagram @theyarnattic, tag us in your current and finished projects #theyarnattic. We would love to see what you’re making!